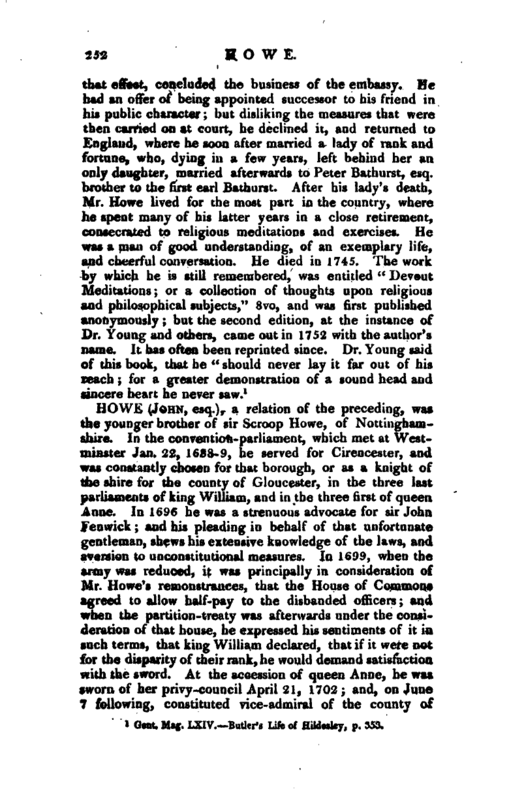 WORDS: BIOG: Howe, John, Esq. , a relation of the preceding, was the younger brother of sir Scroop Howe, of Nottinghamshire. In the convention-parliament, which met at Westminster Jan. 22, 1688-9, he served for Cirencester, and was constantly chosen for that borough, or as a knight of the shire for the county of Gloucester, in the three last parliaments of king William, and in the three first of queen Anne. In 1696 he was a strenuous advocate for sir John Fenwick; and his pleading in behalf of that unfortunate gentleman, shews his extensive knowledge of the laws, and aversion to unconstitutional measures. In 1699, when the army was reduced, it was principally in consideration of Mr. Howe’s remonstrances, that the House of Commons agreed to allow half-pay to the disbanded officers; and when the partition-treaty was afterwards under the consi* deration of that house, he expressed his sentiments of it in guch terms, that king William declared, that if it were not foi the disparity of their rank, he would demand satisfaction with the sword. At the accession of queen Anne, he was sworn of her privy-council April 21, 1702; and, on June 7 following, constituted vice-admiral of the county of | Gloucester. Before the end of that year, Jan. 4, 1702-3, he was constituted paymaster-general of her majesty’s guards and garrisons. 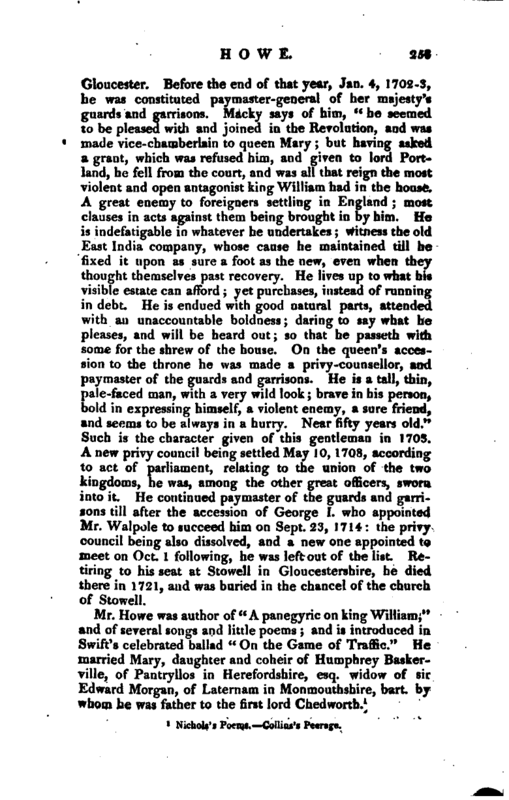 Macky says of him, “he seemed to be pleased with and joined in the Revolution, and was made vice-chamberlain to queen Mary; but having asked a grant, which was refused him, and given to lord Portland, he fell from the court, and was all that reign the most violent and open antagonist king William had in the house. A great enemy to foreigners settling in England; most clauses in acts against them being brought in by him. He is indefatigable in whatever he undertakes; witness the old East India company, whose cause he maintained till he> fixed it upon as sure a foot as the new, even when they thought themselves past recovery. He lives up” to what his visible estate can afford; yet purchases, instead of running in debt. He is endued with good natural parts, attended with an unaccountable boldness; daring to say what he pleases, and will be heard out; so that he passeth with some for the shrew of the house. On the queen’s accession to the throne he was made a privy-counsellor, and paymaster of the guards and garrisons. He is a tall, thin, pale-faced man, with a very wild look; brave in his person, bold in expressing himself, a violent enemy, a sure friend, and seems to be always in a hurry. Near fifty years old." 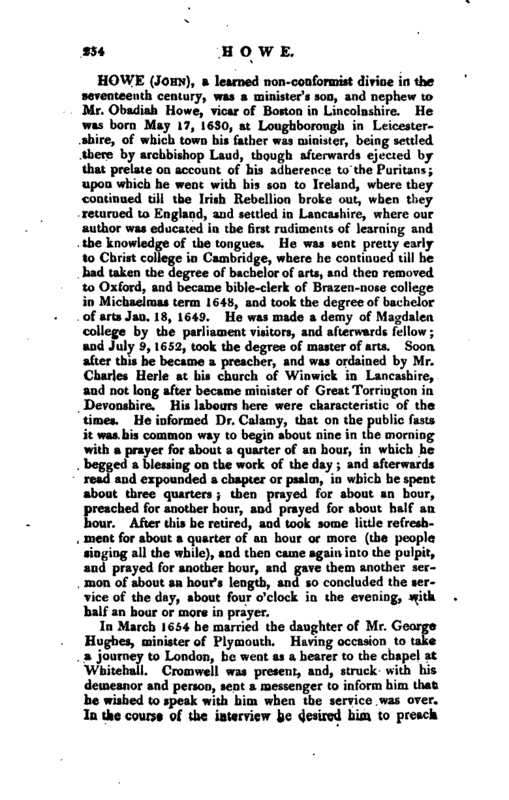 Such is the character given of this gentleman in 1703. A new privy council being settled May 10, 1708, according to act of parliament, relating to the union of the two kingdoms, he was, among the other great officers, sworn into it. He continued paymaster of the guards and garrisons till after the accession of George I. who appointed Mr. Walpole to succeed him on Sept. 23, 1714: the privy council being also dissolved, and a new one appointed to meet on Oct. 1 following, he was left out of the list. Retiring to his seat at Stowell in Gloucestershire, he died there in 1721, and was buried in the chancel of the church of Stowell.